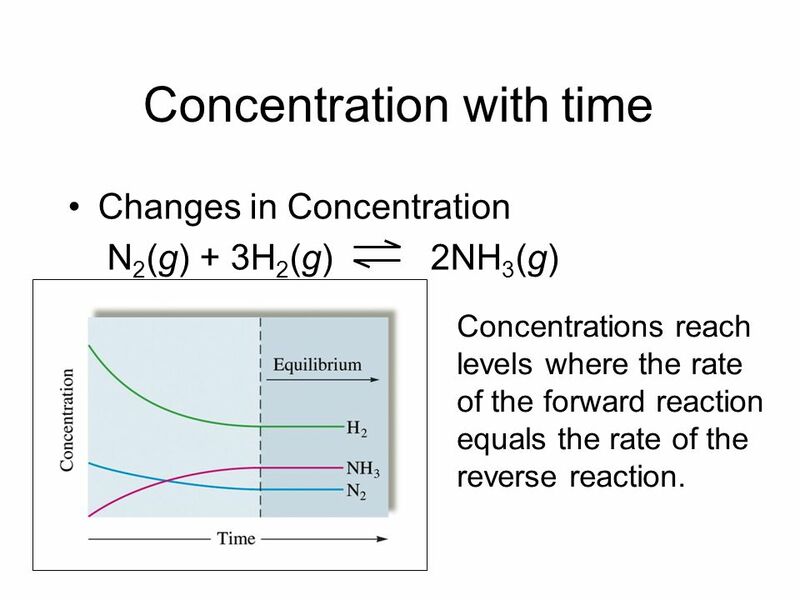 Changes in Concentration N2(g) + 3H2(g) NH3(g) Concentrations reach levels where the rate of the forward reaction equals the rate of the reverse reaction. 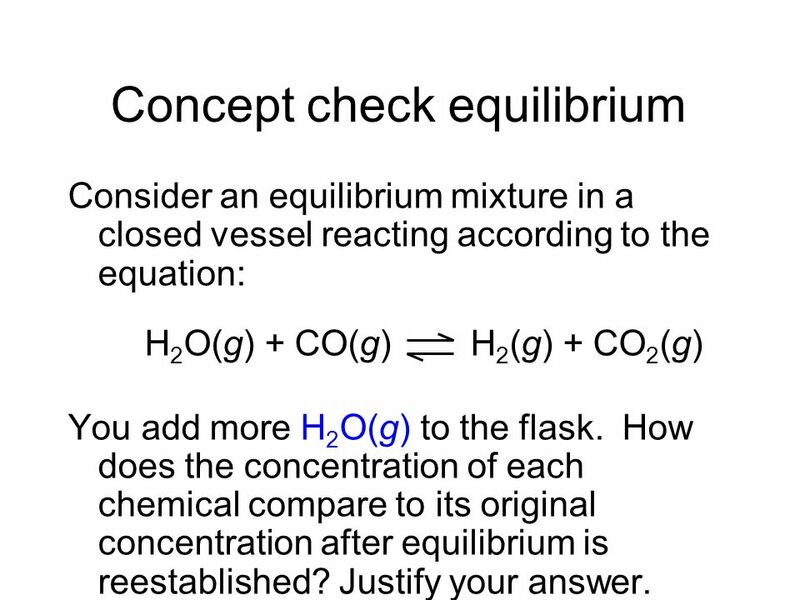 Consider an equilibrium mixture in a closed vessel reacting according to the equation: H2O(g) + CO(g) H2(g) + CO2(g) You add more H2O(g) to the flask. 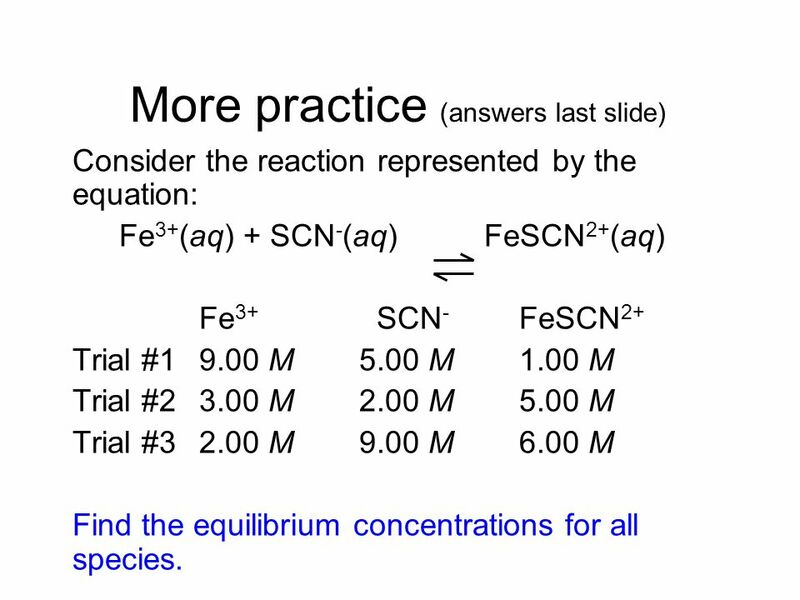 How does the concentration of each chemical compare to its original concentration after equilibrium is reestablished? Justify your answer. 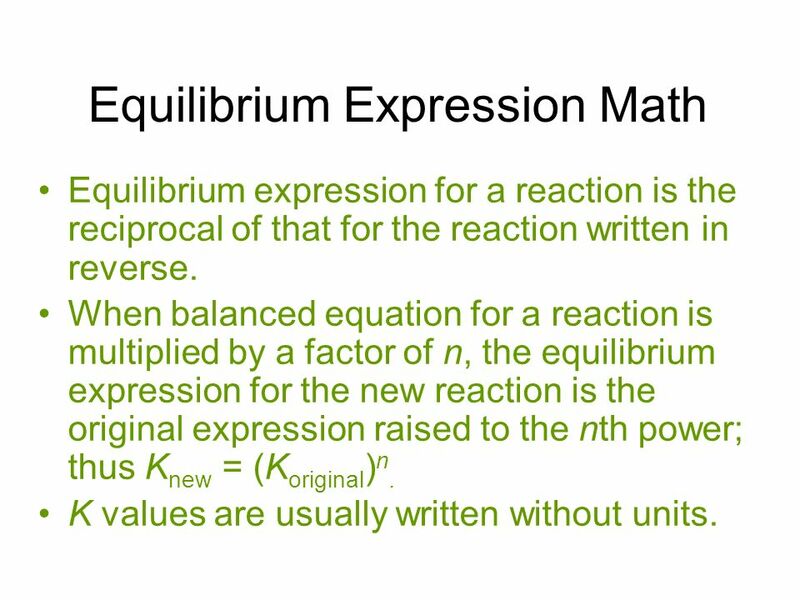 Equilibrium expression for a reaction is the reciprocal of that for the reaction written in reverse. 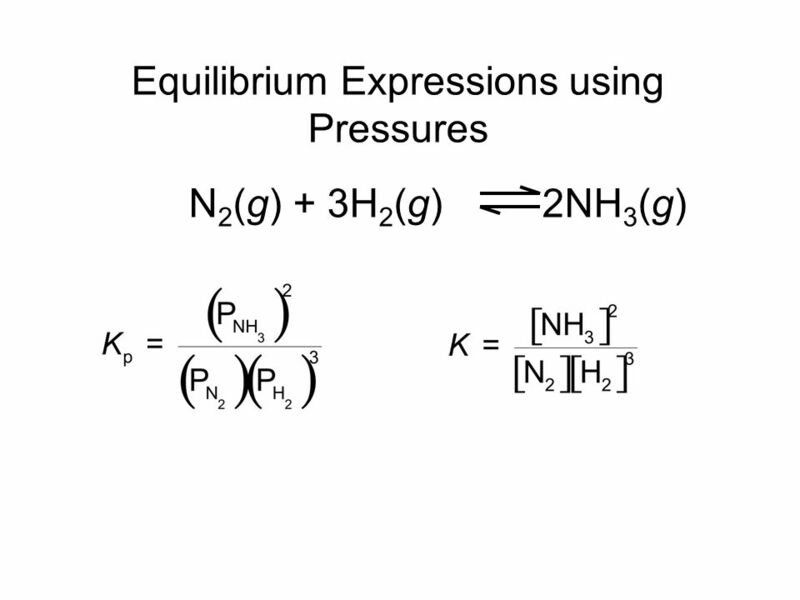 When balanced equation for a reaction is multiplied by a factor of n, the equilibrium expression for the new reaction is the original expression raised to the nth power; thus Knew = (Koriginal)n. K values are usually written without units. 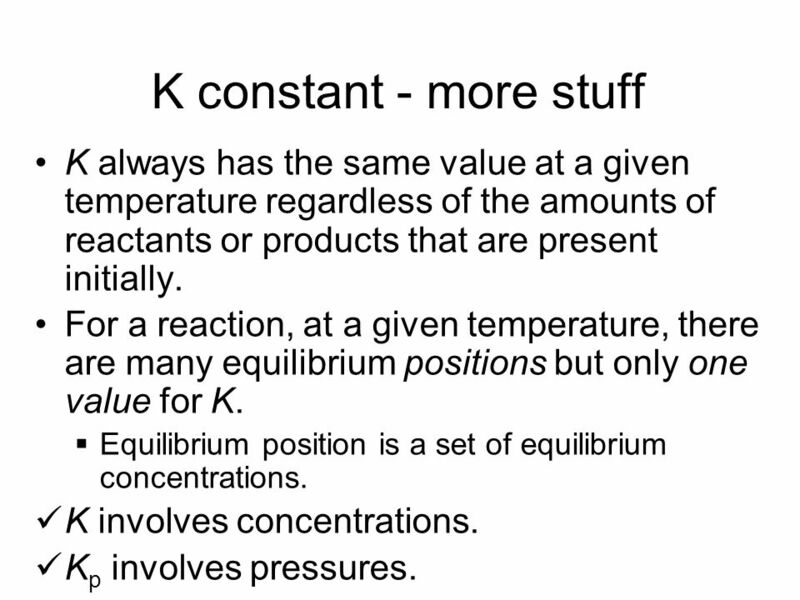 8 K constant - more stuff K always has the same value at a given temperature regardless of the amounts of reactants or products that are present initially. 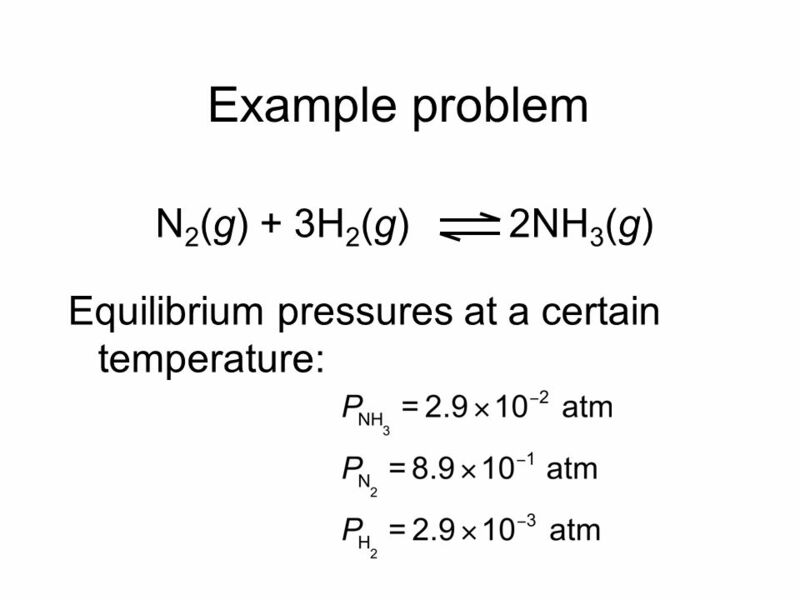 For a reaction, at a given temperature, there are many equilibrium positions but only one value for K. Equilibrium position is a set of equilibrium concentrations. 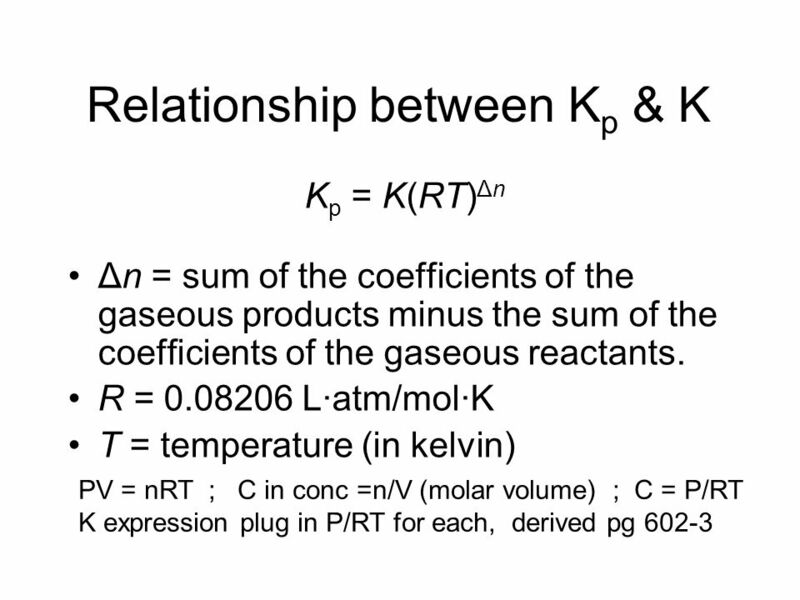 K involves concentrations. Kp involves pressures. 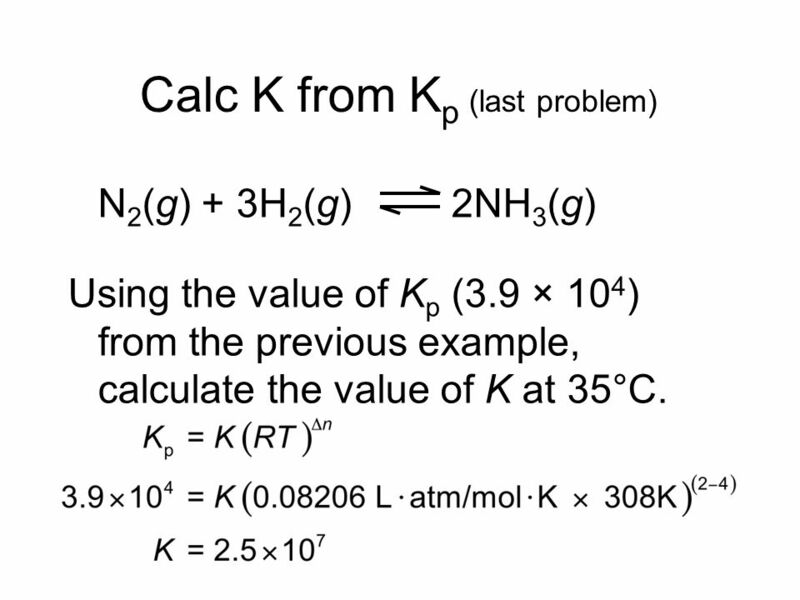 N2(g) + 3H2(g) NH3(g) Using the value of Kp (3.9 × 104) from the previous example, calculate the value of K at 35°C. 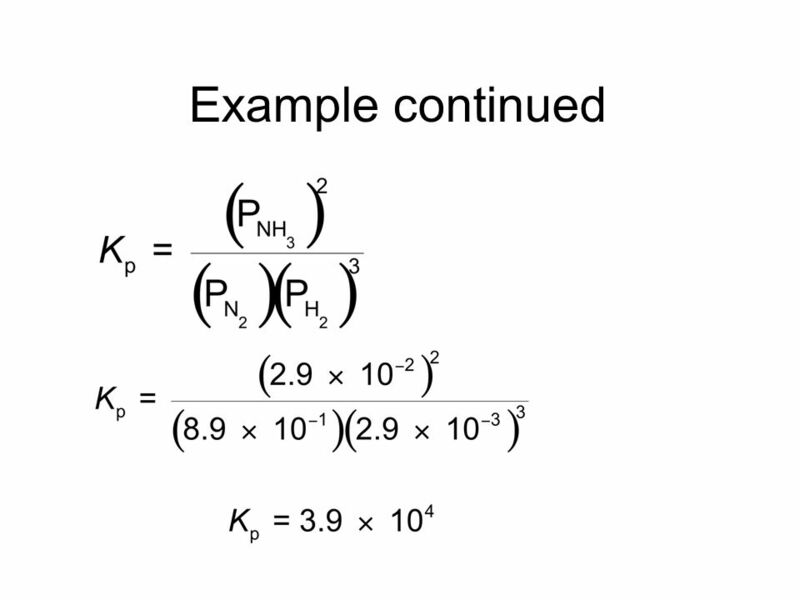 Extent of a reaction A value of K much larger than 1 means that at equilibrium the reaction system will consist of mostly products – the equilibrium lies to the right. Reaction goes essentially to completion. 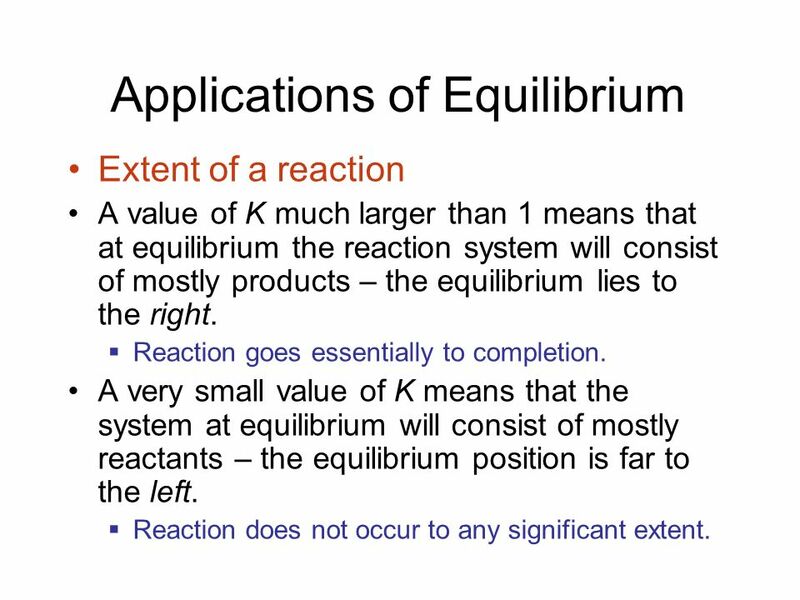 A very small value of K means that the system at equilibrium will consist of mostly reactants – the equilibrium position is far to the left. Reaction does not occur to any significant extent. 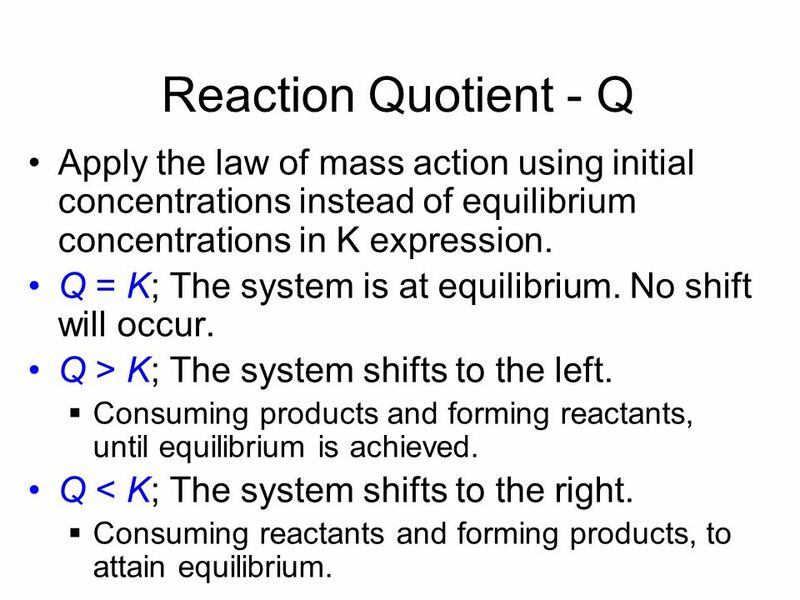 18 Reaction Quotient - Q Apply the law of mass action using initial concentrations instead of equilibrium concentrations in K expression. 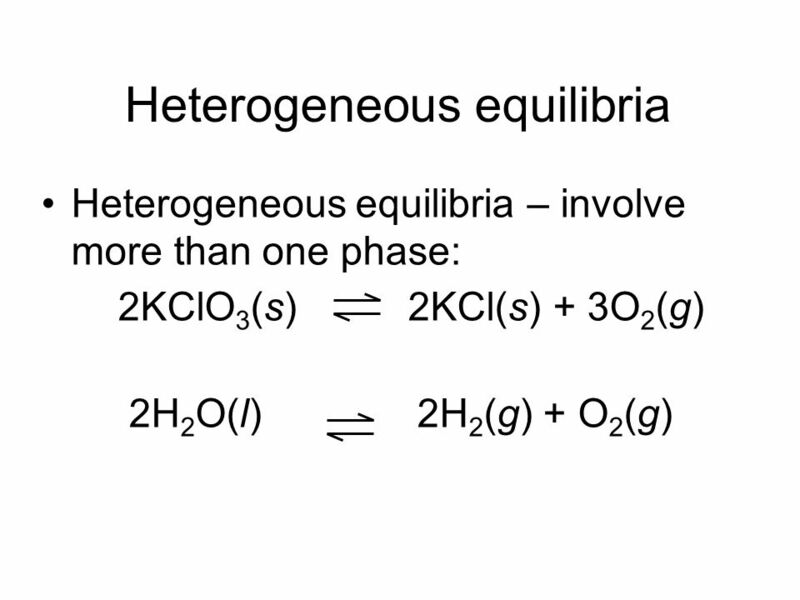 Q = K; The system is at equilibrium. No shift will occur. Q > K; The system shifts to the left. Consuming products and forming reactants, until equilibrium is achieved. 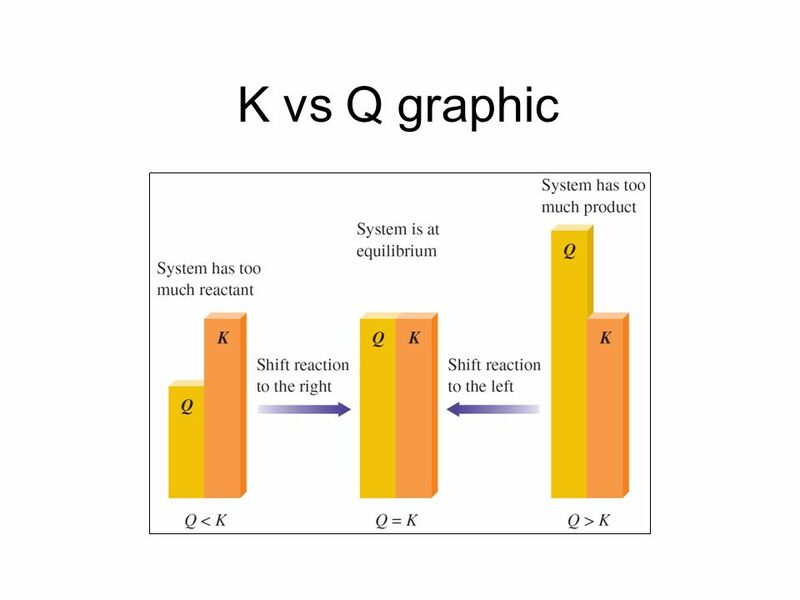 Q < K; The system shifts to the right. Consuming reactants and forming products, to attain equilibrium. 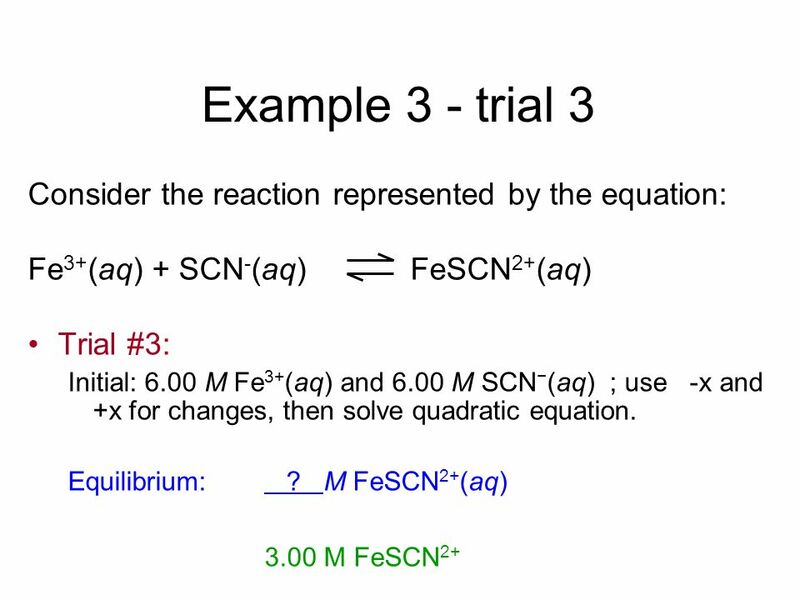 Consider the reaction represented by the equation: Fe3+(aq) + SCN-(aq) FeSCN2+(aq) Trial #1: 6.00 M Fe3+(aq) and 10.0 M SCN-(aq) are mixed at a certain temperature and at equilibrium the concentration of FeSCN2+(aq) is 4.00 M. What is the value for the equilibrium constant for this reaction? 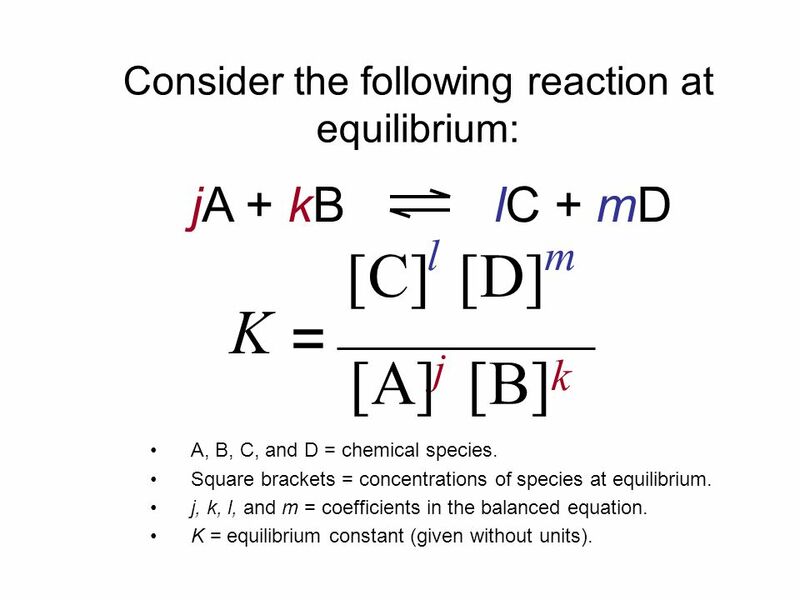 Write the balanced equation for the reaction. 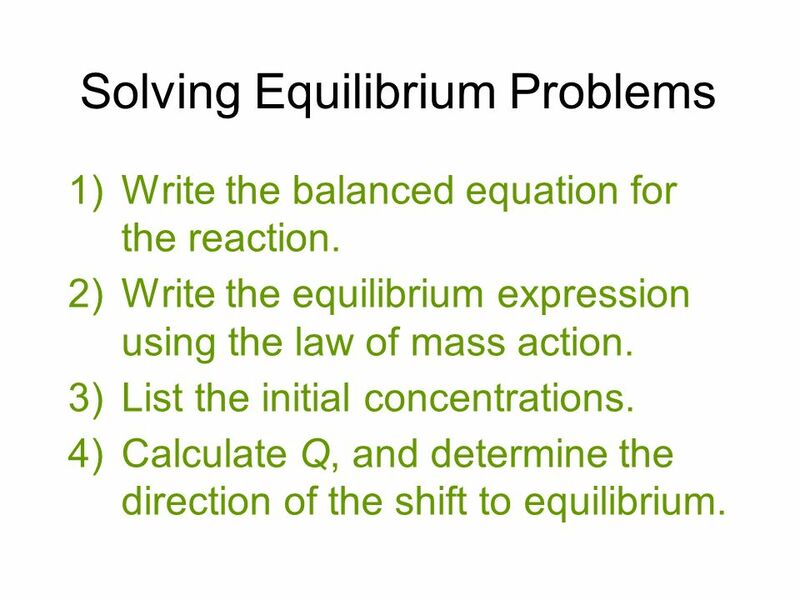 Write the equilibrium expression using the law of mass action. 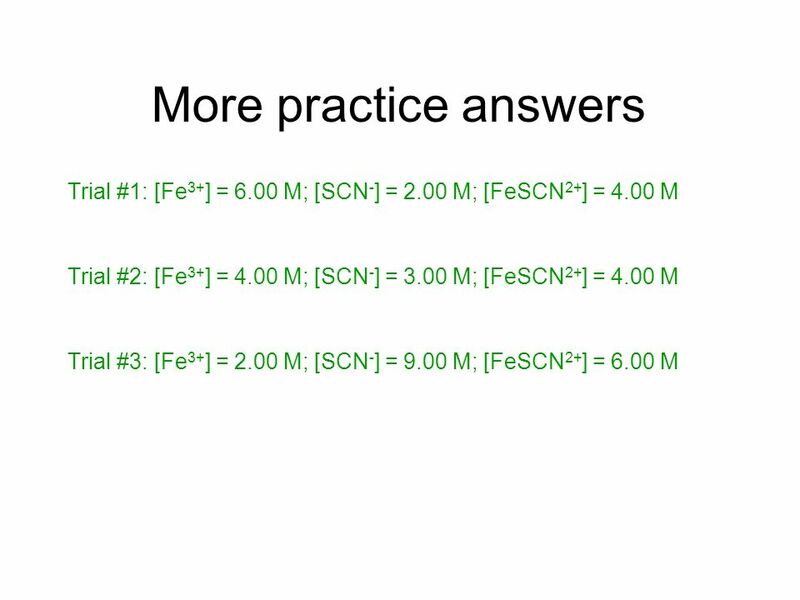 List the initial concentrations. Calculate Q, and determine the direction of the shift to equilibrium. 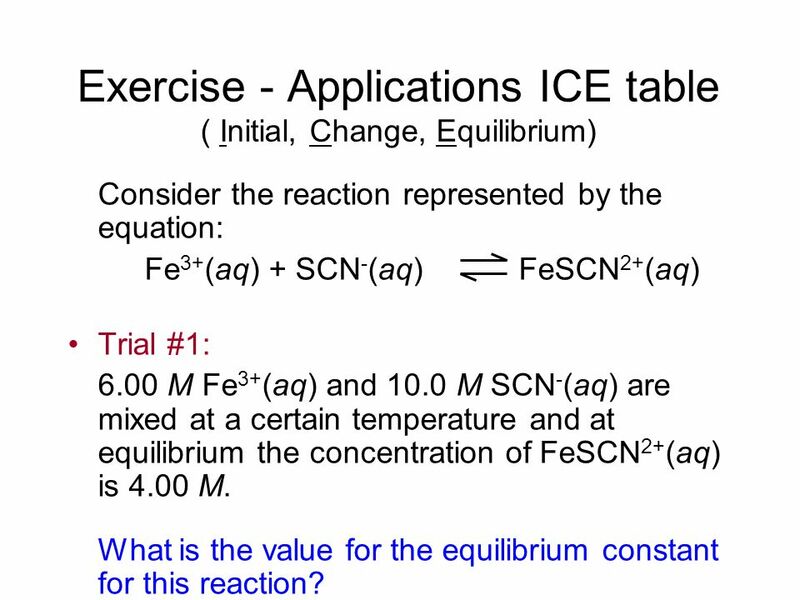 5)	Define the change needed to reach equilibrium, and define the equilibrium concentrations by applying the change to the initial concentrations. 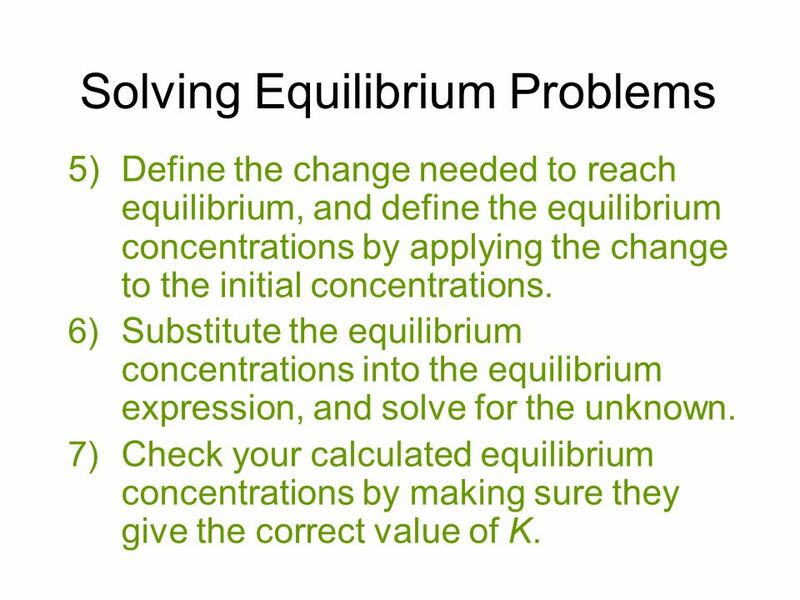 Substitute the equilibrium concentrations into the equilibrium expression, and solve for the unknown. 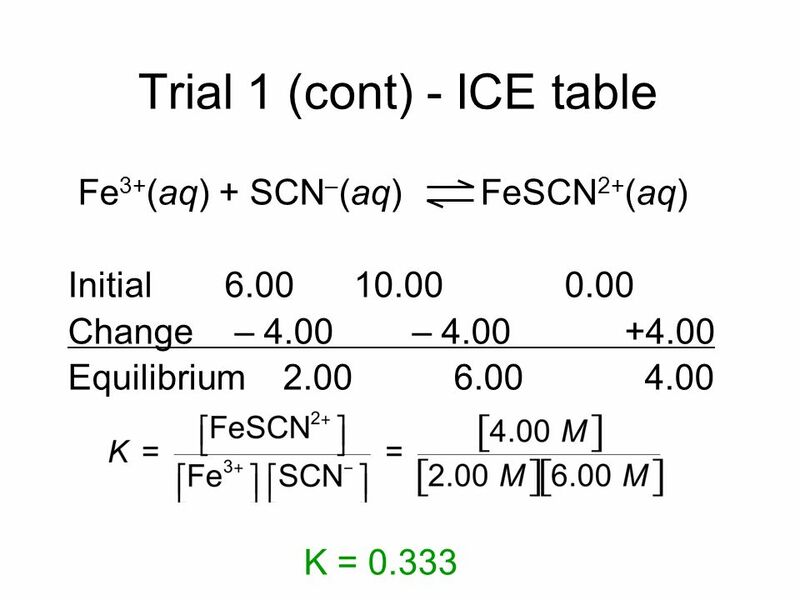 Check your calculated equilibrium concentrations by making sure they give the correct value of K.
Consider the reaction represented by the equation: Fe3+(aq) + SCN-(aq) FeSCN2+(aq) Fe SCN-	FeSCN2+ Trial # M	5.00 M	1.00 M Trial # M	2.00 M	5.00 M Trial # M	9.00 M	6.00 M Find the equilibrium concentrations for all species. 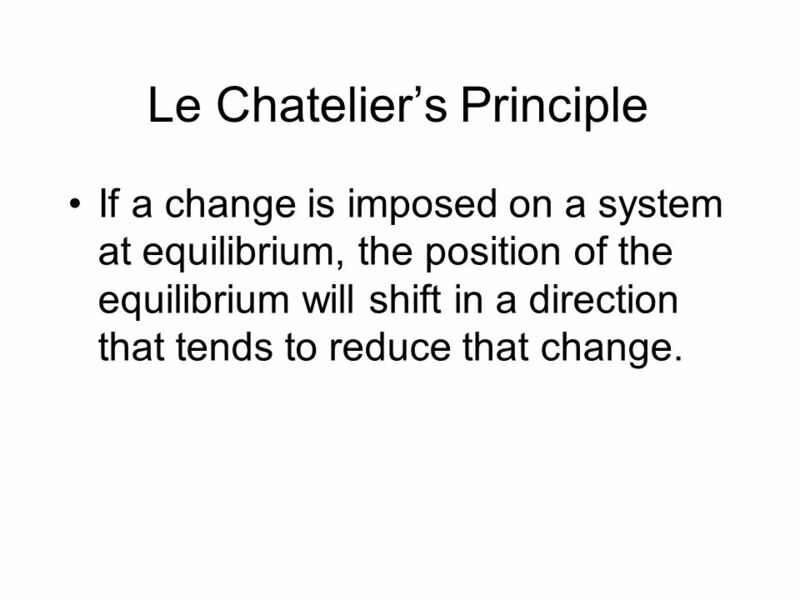 If a change is imposed on a system at equilibrium, the position of the equilibrium will shift in a direction that tends to reduce that change. Concentration: The system will shift away from the added component. If a component is removed, the opposite effect occurs. 2. 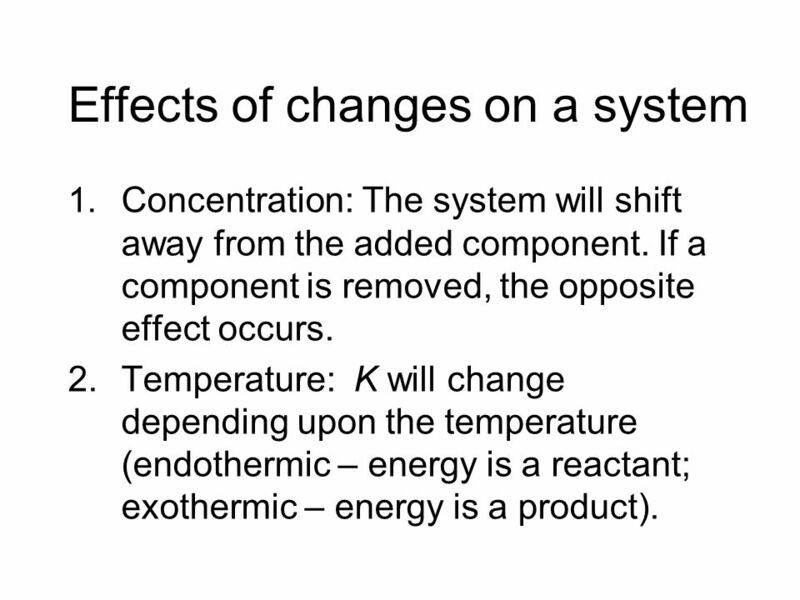 Temperature: K will change depending upon the temperature (endothermic – energy is a reactant; exothermic – energy is a product). Pressure: The system will shift away from the added gaseous component. If a component is removed, the opposite effect occurs. 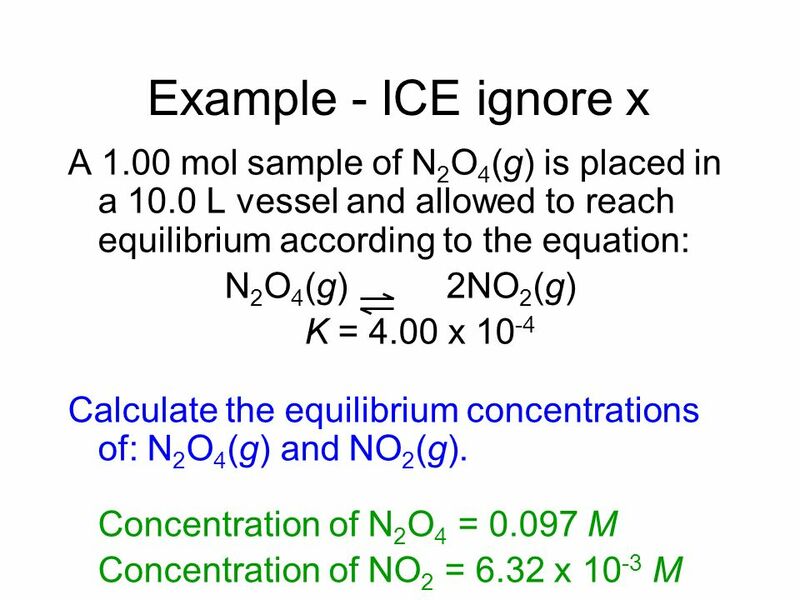 Addition of inert gas does not affect the equilibrium position. 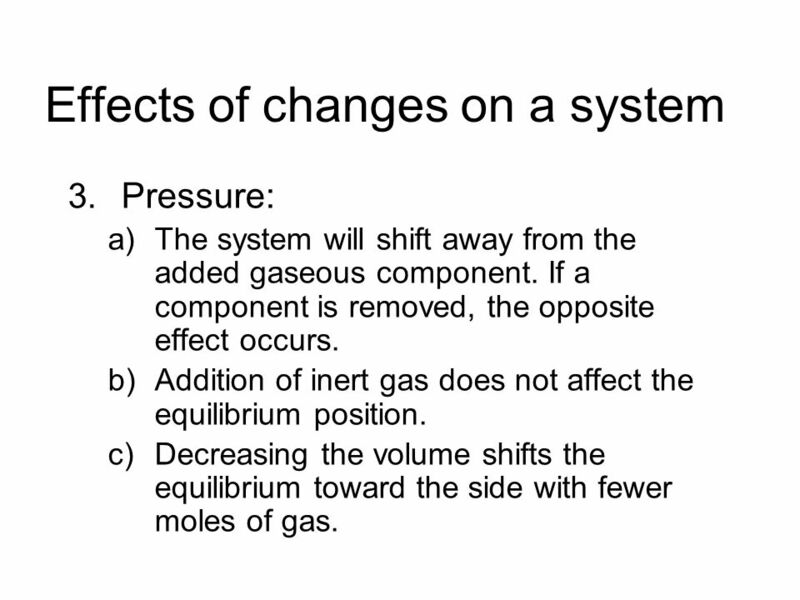 Decreasing the volume shifts the equilibrium toward the side with fewer moles of gas. 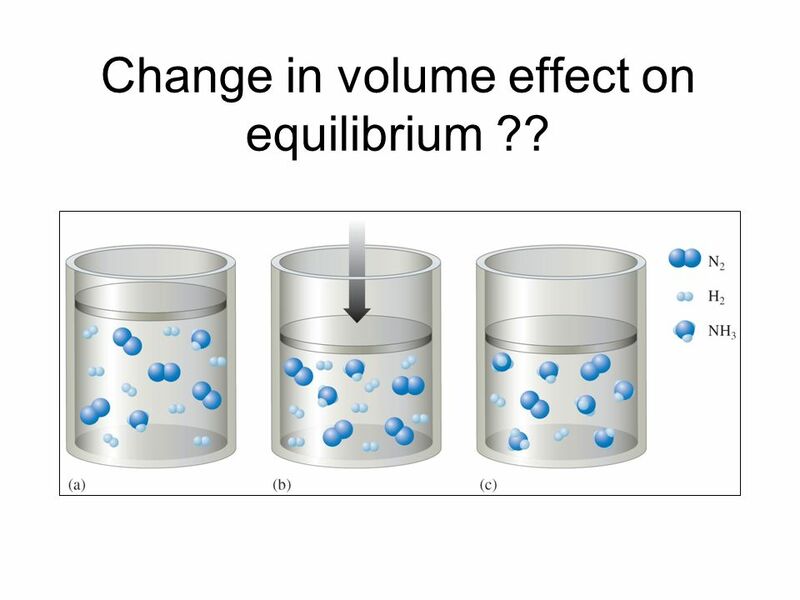 31 Change in volume effect on equilibrium ?? 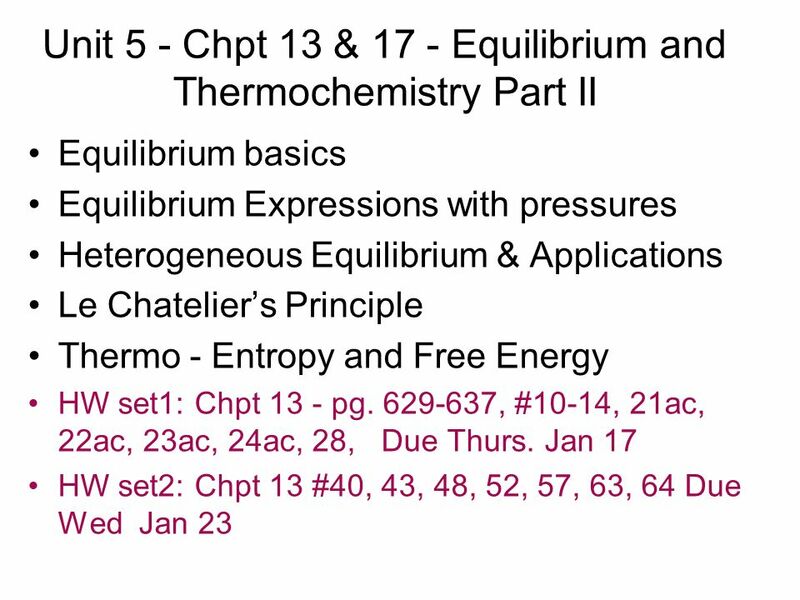 Download ppt "Unit 5 - Chpt 13 & 17 - Equilibrium and Thermochemistry Part II"
CHEMICAL EQUILIBRIUM. Chemical Equilibrium Reversible Reactions: A chemical reaction in which the products can react to re-form the reactants Chemical. CHEMICAL EQUILIBRIUM Cato Maximilian Guldberg and his brother-in-law Peter Waage developed the Law of Mass Action. Chemical Equilibrium AP Chem Unit 13. ADVANCED PLACEMENT CHEMISTRY EQUILIBRIUM. 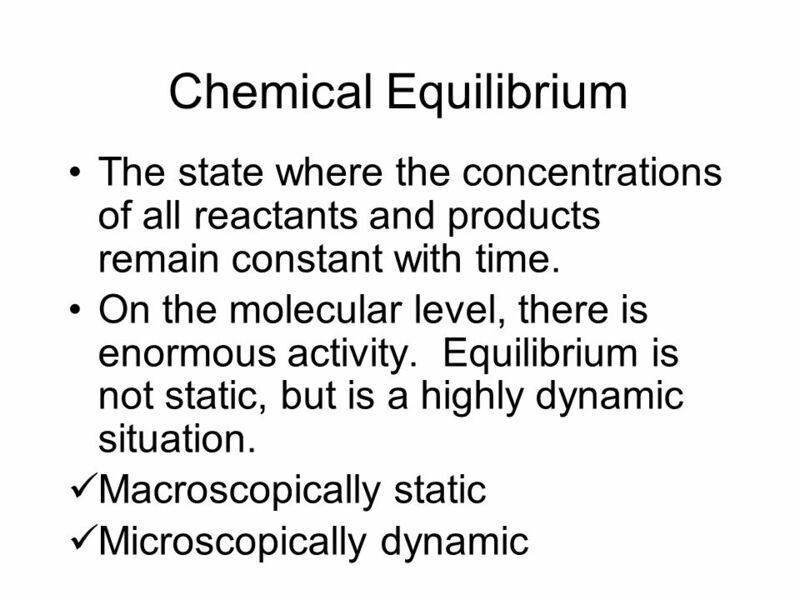 Chemical equilibrium * state where concentrations of products and reactants remain constant *equilibrium is. AP Chapter 15. 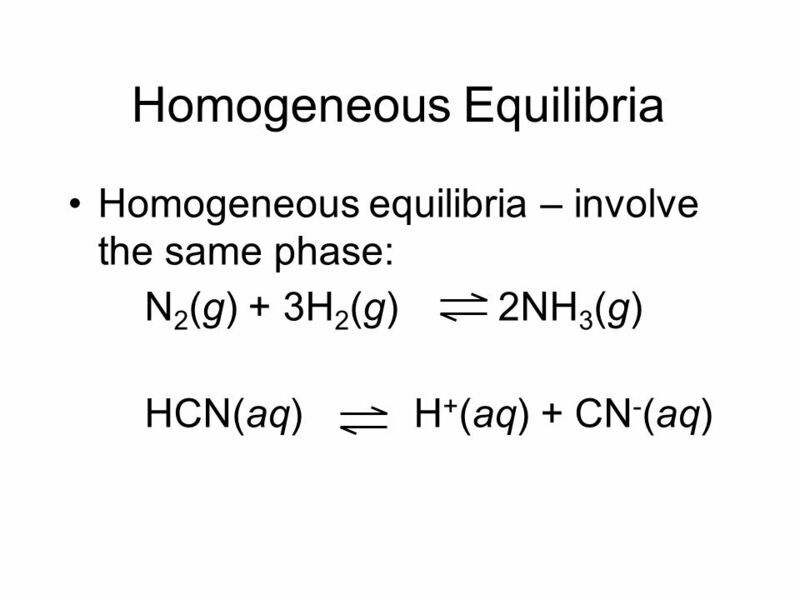  Chemical Equilibrium occurs when opposing reactions are proceeding at equal rates. 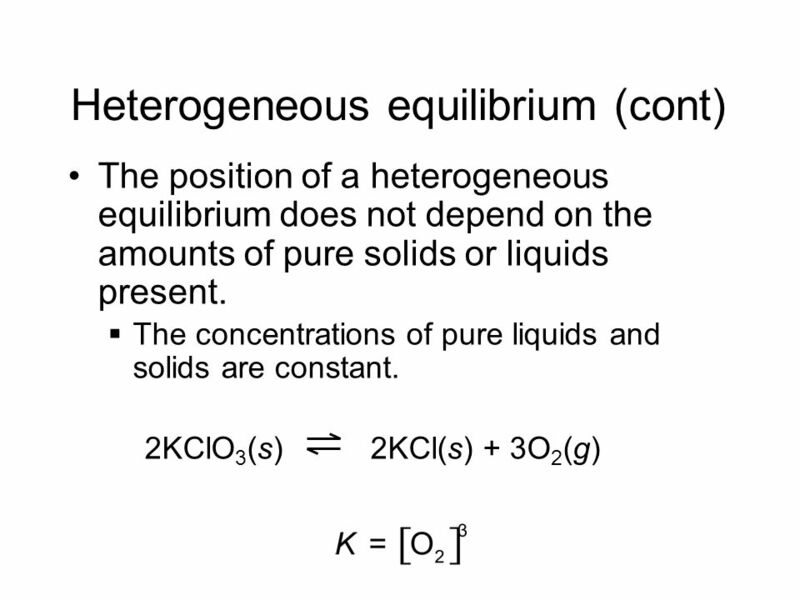  It results in the formation of an equilibrium mixture. 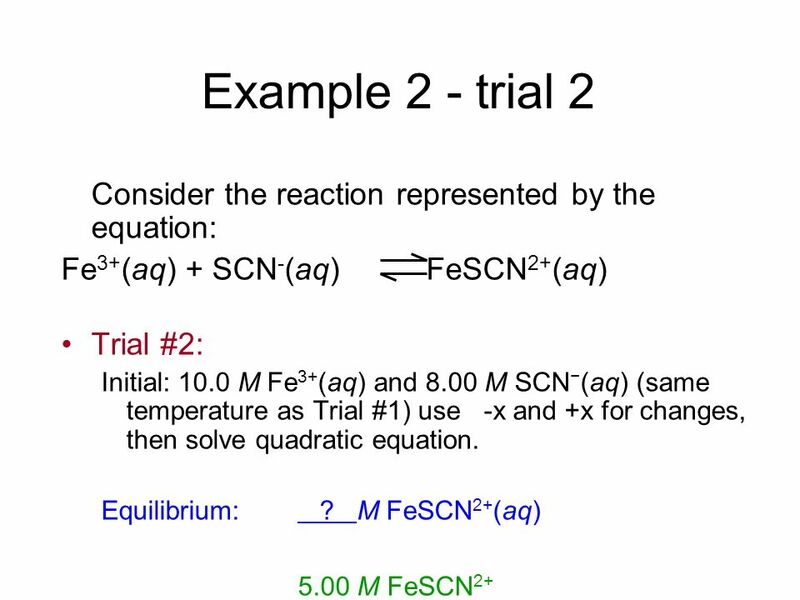 Chemical Equilibrium Chapter 13. 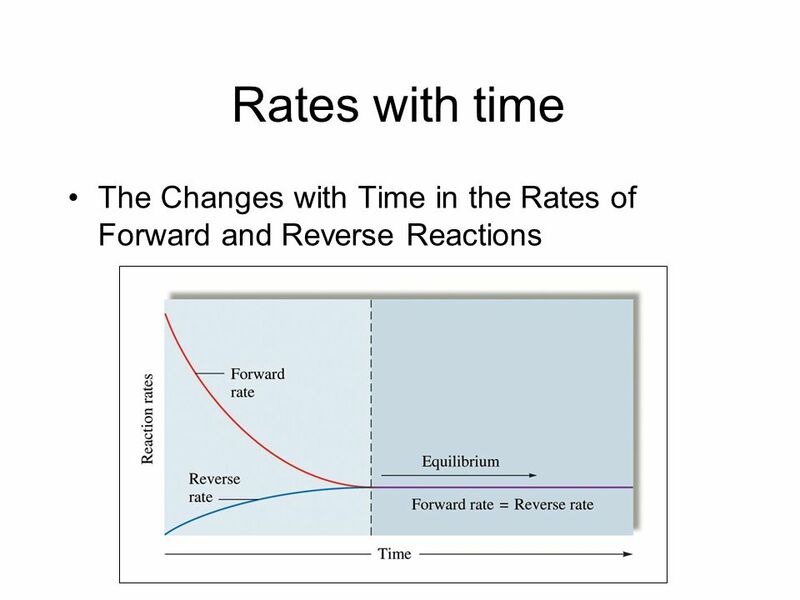 Chemical Equilibrium The state where the concentrations of all reactants and products remain constant with time. On the. Chapter 15 Chemistry the Central Science 12th Ed. 13.1 Equilibrium Conditions When a system is at equilibrium it may appear that everything has stopped; however, this is NOT the case. Think of chemical.